It is with great sadness that the family of Elva Ward announce that she passed away peacefully at Kelowna General Hospital on October 12, 2018 at the age of 98. Elva is survived by her daughters Gloria (Ron), Diane (Dan – predeceased), Debra (David), and Cheryl (Alan), sons Wayne (Shirley) and Gary (Carole), 11 grandchildren, 8 great grandchildren and sisters Audrey, June and Marge. She is predeceased by her husband Wilf, infant son Dean, parents Amelia and Walter Payne and sisters Eileen and Irene. 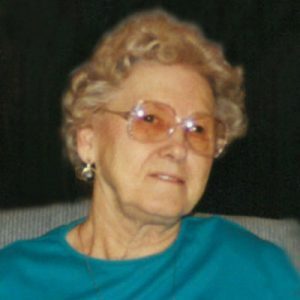 Elva was born in Roblin, MB in 1920 and married the love of her life, Wilf, in 1937. They farmed for many years before moving to Kelowna in 1969. Elva worked for many years at Sun Rype before retiring in 1984. Her passion was knitting for her family and the Kelowna General Hospital gift shop. She loved visiting with her family and having them over for meals. Special thanks to Doctors Obedkoff and Imrie and the staff at Mountainview Home Care. A St. Paul’s United Church Funeral Service will be hosted on Sunday, October 28, 2018 at 12:00 pm at the Seventh-day Adventist Church, 1130 Springfield Rd, Kelowna, BC. A reception will follow. The service for WARD, Elva is scheduled for Sunday, October 28, 2018 at 12:00 pm. Below you will find the map for the service location and the contact information should you have any questions. Our heartfelt condolences to Gloria and family. You are in our thoughts and prayers today and in the days ahead.